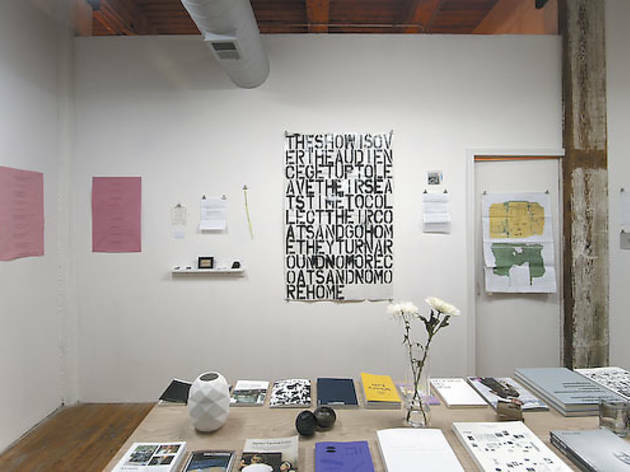 Karly Wildenhaus curates an exhibition of take-away work. 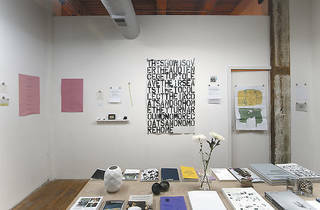 Photograph: Golden Age Installation view of "Twice Removed" at Golden Age, 2011. “I wanted to make artwork that could disappear,” Felix Gonzalez-Torres (1957–96) said of his installation Untitled (Placebo): a shiny spread of wrapped candies, which viewers are free to take. The depletion of the candy is a metaphor for his lover’s death, yet the work lives on, the sweets endlessly replenished by museum staff. “Twice Removed” brings together gratis artworks such as cards typewritten by Lawrence Weiner in 1970 and prints by Gordon Matta-Clark. But visitors shouldn’t abscond with these individual examples of large-run or unlimited “take-aways”: Curator Karly Wildenhaus borrowed them from collectors around the world. In sharing these works anew, Wildenhaus increases their value. Golden Age will publish a pamphlet version of “Twice Removed,” ensuring this thoughtful exhibition lives on in a new form.